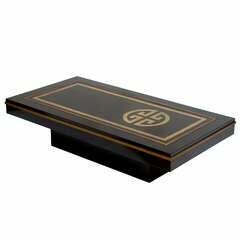 The top is made of cherrywood veneer. The side frame is made of cognac leather. Made from Swiss manufacture De Sede. This coffee table in teak was designed by Poul Jensen for Selig 1960s Denmark. A great addition for the Scandinavian modern living room. 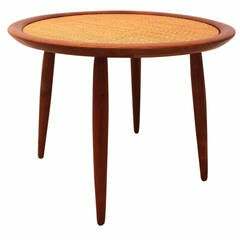 Haslev Møbelsnedkeri coffee table of massive cheerywood with oval plate and tapered legs. 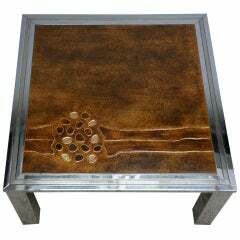 Mahogany and marble coffee table by De Coene in Japanoiserie style. Belgium, circa 1950. Measures: L 200 cm, H 50 cm, D 65 cm.